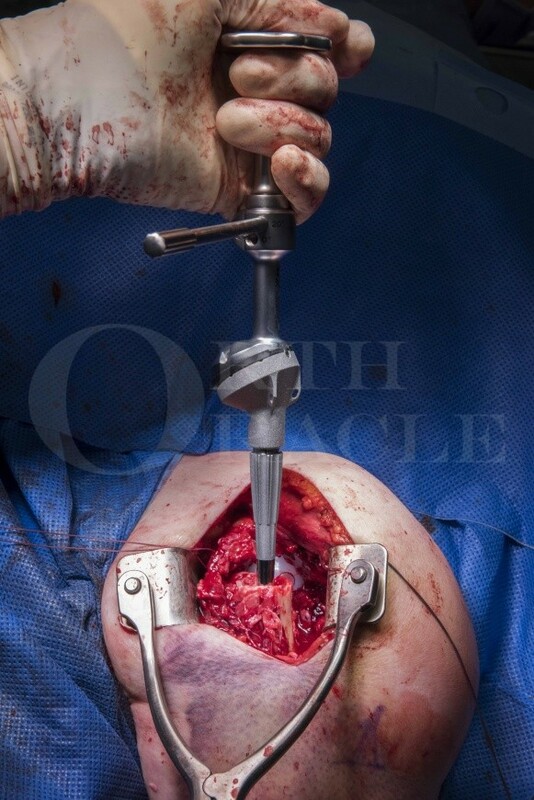 Learn the Lima SMR Reverse Total Shoulder Replacement for proximal humeral fracture surgical technique with step by step instructions on OrthOracle. Our e-learning platform contains high resolution images and a certified CME of the Lima SMR Reverse Total Shoulder Replacement for proximal humeral fracture surgical procedure. It is notoriously difficult to achieve a good functional outcome in older patients with displaced comminuted proximal humerus fractures managed surgically. In recent years shoulder surgeons have considered that this injury should be treated as a fracture with rotator cuff deficiency and hence have been using reverse geometry total shoulder replacements with a prosthetic ball on the glenoid (the glenosphere) and socket on the humeral side of a semi-constrained construct. This medialises the centre of rotation and increases the moment arm on which the large deltoid muscle can work in the absence of the rotator cuff tendons which normally insert around the proximal humerus. The main design remit for reverse shoulder arthroplasty was to address the difficult problem of arthritis in the rotator cuff deficient shoulder so called cuff tear arthropathy which presents as a chronic condition. Such implants have been in widespread use over the last 30 years gaining in popularity such that they have overtaken the number of anatomical shoulder replacements performed. More recently the same implants have been used to treat comminuted displaced fractures of the proximal humerus. Traditionally such fractures have been associated with relatively poor outcomes when managed either conservatively or with internal fixation. The latter has been made significantly easier with contoured proximal humeral locking plates but still such surgery in osteoporotic bone is technically difficult and often associated with poor outcomes. A significant risk is avascular necrosis of the humeral head and resorption of the tuberosities with consequent rotator cuff dysfunction mimicking cuff tear arthropathy hence the adoption of reverse geometry arthroplasty. An alternative would be to consider hemiarthroplasty reconstruction of the proximal humerus using a stemmed hemiarthroplasty prosthesis with reconstruction of the tuberosities around the implant. In such cases the significant problem is that the tuberosities resorb and the patient is left with a metal spacer and a rotator cuff deficient shoulder. Implant companies have developed fracture specific reverse geometry implants which are tailored to the task. The Lima SMR is one of these as part of the spectrum of options available on their platform system. It uses the same glenosphere and humeral stem (cemented or uncemented) as their cuff tear arthropathy stemmed prosthesis but has a module trauma body added to the humeral stem which incorporates holes for passage of sutures to repair residual small fragments of bone and rotator cuff remnants. Whilst there is some evidence in sporadic publications we are yet to have good hard level 1 evidence that reverse geometry arthroplasty in such cases is reliably and significantly better than either conservative management, internal fixation or hemiarthroplasty reconstruction, however there are trials ongoing to try and address the issue. Anecdotally most shoulder surgeons will have many examples of good outcomes from reverse geometry arthroplasty in such cases.